When it comes to writing about polarization in American, who can blame journalists for expressing confusion? The Washington Post’s Dan Balz is the latest reporter to grapple with conflicting evidence and, perhaps more importantly, conflicting interpretation of the evidence by political scientists. In this recent article Balz discusses the results of a new study conducted by the Program for Consultation at the University of Maryland that shows there is little difference in the policy views of citizens in “red” and “blue” congressional districts. (Their findings mirror those of Fiorina, Abrams and Pope in their Culture Wars?) In the same article, however, Balz also quotes political scientist Alan Abramowitz’s take on other data that Abramowitz suggests shows Americans are in fact deeply polarized. However, as I have discussed in several posts, most of the evidence used to support this claim does not show a process of polarization, as commonly understood. Instead, it shows a process of party sorting. To understand the difference, consider these two graphs taken from a recent paper by Sam Abrams and Mo Fiorina that discusses polarization and sorting. This first graph illustrates what most people think of when they hear the term political polarization. 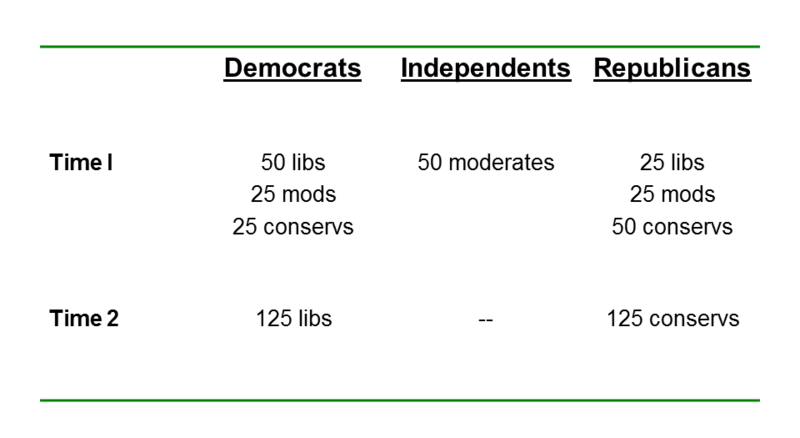 It shows the elimination from Time 1 to Time 2 in the number of moderates, as well as non-liberals in the Democratic Party and non-conservatives in the Republican Party. 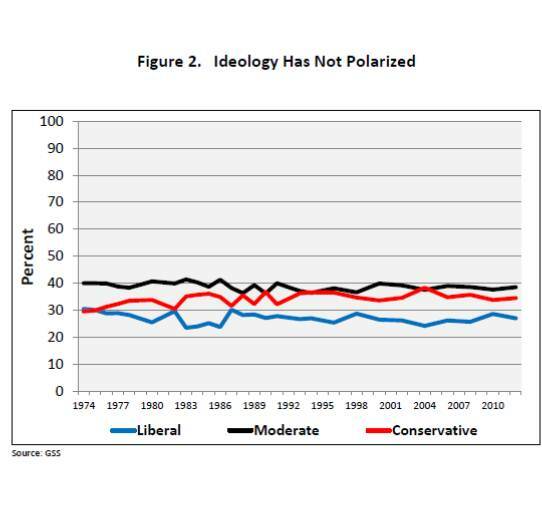 The end result is an increase in the number of liberals and conservatives, and the disappearance of moderates, consistent with what many people understand polarization to mean. Now, consider graph 2. 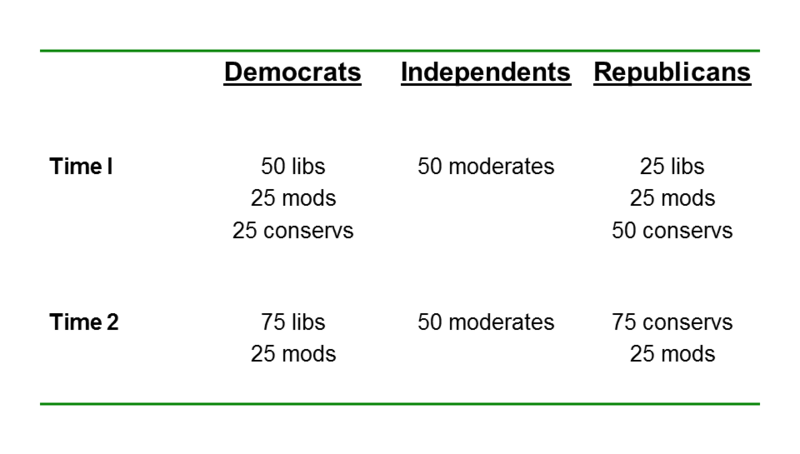 Here the total number of moderates does not change from Time 1 to Time 2, but both parties purge themselves (through conversion and migration) of most of those who are out of step with the party’s dominant ideology (although some moderate leaners remain in each party). However, there is no increase in the total number of liberals or conservatives – indeed, in the aggregate, the distribution of political ideology hasn’t changed at all. All that has occurred is a better sorting of party affiliation with ideology, so that the Democratic Party has become more uniformly liberal and the Republican more uniformly conservative. Which is more consistent with what has actually happened in the United States? You decide. 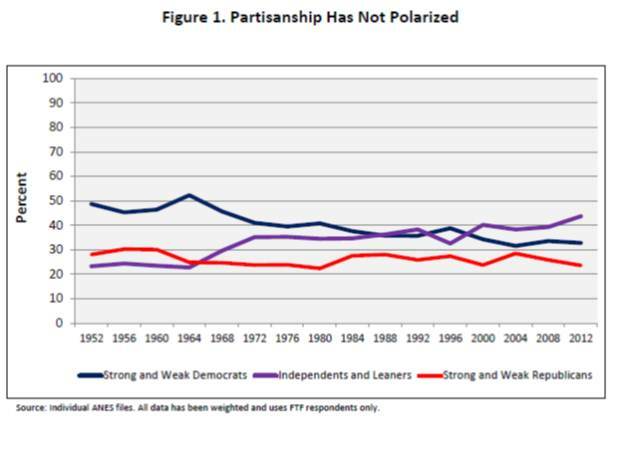 Here is a chart, again from Abrams and Fiorina, showing the change in the distribution of partisan affiliation, based on American National Election Studies surveys, since 1952. As you can see, if there is any long-term movement, it is in the slight increase in the number of self-described independents and those leaning independent. How about changes in ideology over time? Again, as the following chart shows, we see very little movement in those calling themselves liberals, moderates and conservatives. Both sets of data, then, are consistent with what Fiorina (and others) have described as party sorting, rather than political polarization. Nonetheless, some colleagues in the profession suggest that party sorting is itself simply another version of polarization. The argument is that even if the parties, or the number of liberals and conservatives, have not grown larger at the expense of the moderate middle, the center of ideological gravity in each party has certainly shifted toward the extremes. So we have seen a process of partisan polarization, albeit not the kind that comports with what many laypeople understand polarization to mean. I am uncomfortable with this broader use of the term polarization for several reasons. First, most laypeople, including journalists, don’t always appreciate the differences in the two processes – when they see the phrase polarization, they assume it means a general movement within the public toward the ideological extremes at the expense of the center. (It doesn’t help that stories often drop the adjective partisan when describing polarization.) It bears repeating that there has been no real growth in the number of Democrats or Republicans, which some might argue should be happening based on the term partisan polarization. Second, encompassing different processes under the single term robs polarization of some of its analytical bite. If the processes are different, we ought to acknowledge that by using different terminology. It is confusing enough for journalists and laypeople to hear social scientists give different interpretations based on the same set of data. We shouldn’t further muddy the waters by using the same term to describe very different processes. (Otherwise we should expect more stories with the headlines similar to “We’re Not That Polarized. Oh Yes, We Are”.) If journalists are going to rely on social scientists for guidance on these issues, we need to strive for clarity and precision in terminology. Finally, the implications of a growth in party sorting are much different than those emanating from increased political polarization. To use one example, if the public is more polarized, then it becomes harder to blame Congress for partisan gridlock, since they are simply mirroring broader divisions within their constituencies. But if the views of red state and blue state denizens are not so divergent on major issues, as the survey Balz cites suggests, then we must look elsewhere to place the blame. Stanford political science Professor Morris Fiorina, on whose research I relied heavily in writing my Politico piece analyzing the widely publicized results of the recent Pew survey on polarization has written his own take on the subject in this Monkey Cage blog post. In contrast to much of the pundits’ read of the Pew results (but consistent with my read of its survey data), Fiorina does not believe the general public is becoming more polarized. He writes, “In sum, we can argue about the size of the political center in the United States since the answer depends on various ways of measuring it, but whichever measure one chooses, the conclusion is the same: the country as a whole is no more polarized than it was a generation ago.” Instead, he argues that what Pew shows is a process of party sorting in which partisanship, ideology and issue positions “go together in a way they did not in the mid-20th century. Issues and ideology used to cross-cut the partisan distribution, now they reinforce it.” The result is that parties are much more ideologically homogeneous than they were half a century ago. This is something I also discussed in the Politico piece, and therefore I won’t elaborate here, but it is this process that those who claim to see evidence of polarization are often describing. But Fiorina makes two additional and very important observations regarding how some of the media commentary indicates a misreading of the Pew Report. The first is that many pundits have misconstrued the growth in ideological consistency among a portion of the public as evidence of increased ideological polarization. But they are not the same. As I noted in the Politico piece, Pew has utilized the same set of 10 questions, with a dichotomous response option (e.g., “homosexuality should be accepted by society” or “homosexuality should be discouraged by society”), to create their liberal-conservative index. The most recent survey results show a doubling, to 21%, in the number of respondents expressing either consistently liberal or conservative opinions across these 10 questions. In defense of pundits who misinterpreted this portion of the Pew Report, the robust publicity (and still continuing!) rollout pushed by Pew , as well as some of the Report’s language seemed to suggest their results indicate a more divided United States. But the Pew data does not show that American is becoming increasingly polarized – only that it is better sorted along party lines and that there has been an increase in ideological consistency. Fiorina also addresses a second result in the Pew survey that has become a matter of some debate: whether political “polarization” is asymmetrical – that is, whether the “growing” extremism – read, partisan sorting – is situated largely within one side of the ideological spectrum (Republican or Democrat). In keeping with Jack Goodman’s admonition to keep these posts short, however, I’ll deal with this issue in tomorrow’s post. For now, however, the key point is this: despite claims to the contrary, the Pew study does not “offer overwhelming evidence of a sharp increase in polarization and in tribal political characterizations over the past two decades, but especially in the past few years.” Instead, it provides further evidence of party sorting. And, contrary to what some have argued, the difference between sorting and polarization is not simply academic hairsplitting. Instead, the two describe completely different phenomena. Polarization refers to a process in which we see movement among Americans away from the moderate center toward the ideological extremes. Party sorting, in contrast, suggests a general stability in the distribution of Americans’ political views with, if other survey data is to be believed, most Americans remaining situated closer to the ideological middle. Deciding what is actually occurring is not simply a “nerd” fight among academic geeks. Instead, the answer has real world ramifications. For example, we might worry less about the increase in congressional polarization if we thought it simply mimicked the evolving views of a polarizing public. But, if Fiorina is right, the polarization in Congress is not a reflection of a growing ideologically divide within the general public. And that should be cause for concern. Are Americans Becoming More Liberal? Politico magazine has published a slightly revised version of my earlier post analyzing the highly publicized Pew Research Center survey that so many media outlets portrayed as evidence that we are living in “the divided United States of America”. (Note: I did not choose the Politico headline, which was a bit more provocative than is probably necessary. But I suppose it drives more traffic that way. It also wasn’t actually the final version I sent them – that version included “Jenny North” as one of my baby boomer archetypes. But no matter – the message is the same. ) I’ll have more to say about some of the Pew survey results, but for now these two interactive graphs tell much of the story. This first graph is what most of the media focused on. The first question on which aggregate opinion has moved in the liberal direction addresses attitudes toward homosexuality. 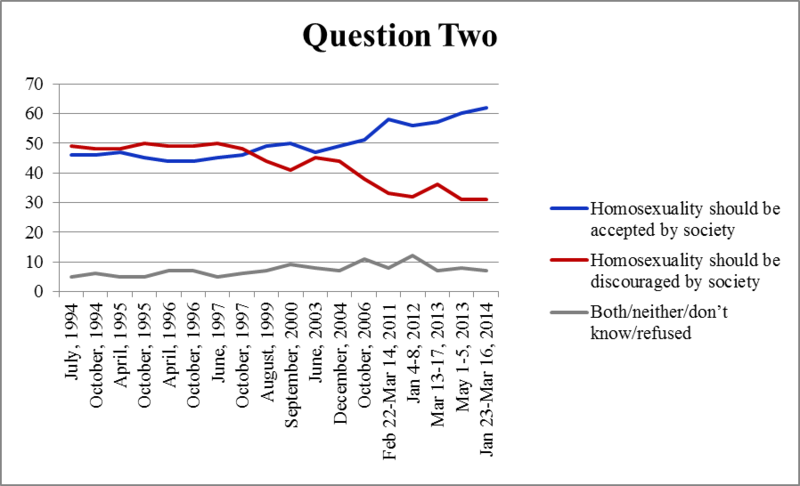 As this graph put together by Middlebury student Tina Berger shows, Americans have become increasingly accepting of homosexuality since 1994, with about 62% in 2014 agreeing “that homosexuality should be accepted by society”, an increase of 16% choosing this response compared to 1994, and 12% above the average agreeing with this statement during the 20-year interval. This appears to be a long-term sustained trend in the liberal direction that started in the mid-1990’s, and it’s not clear if or when it will level off. Source: Pew Research Center 2014 Political Polarization and Typology Survey Final Topline, page 16. The second factor shifting the modal peak to the left is the public’s changing views toward immigration. Today 57% of Pew respondents agree that “Immigrants today strengthen our country because of their hard work and talents” – a figure that is up almost 13% from the 20-year average, and up 26% compared to 1994. To be sure, the trends aren’t uniform, but over two decades the net movement has been toward the liberal response. Source: Pew Research Center 2014 Political Polarization and Typology Survey Final Topline, page 9. On the remaining eight questions, however, there is very little sustained consistent movement in the aggregate in either a liberal or conservative direction. Of course, this can’t tell us what is happening at the individual level. The Pew summary indicates a doubling since 1994 of those holding ideological consistent views, with 21% expressing “either consistently liberal or conservative opinions across a range of issues – the size and scope of government, the environment, foreign policy and many others.” This means most Americans, by Pew’s standard, still hold a mix of views, at least based on responses to these ten questions. And, on most issues, it does not appear that in the aggregate views have changed all that much across two decades. Again, this suggests that despite the media focus on evidence that Americans are growing increasingly divided, the details of the Pew survey results suggest a more complex and perhaps reassuring picture. In sum, while it appears Americans’ views have become more liberal in regards to immigration and homosexuality since 1994, it is not clear whether this means, as some have claimed, that the country is “moving left”. It’s all in how you parse the data. Amid more than a little fanfare, the Pew Research Center released the result of its most recent survey of Americans’ political values based on responses from more than 10,000 adults polled between January and March of this year. Its conclusion? “Republicans and Democrats are more divided along ideological lines – and partisan antipathy is deeper and more extensive – than at any point in the last two decades.” In support of that assessment, the Center provides a wealth of data summarizing not just the survey responses dealing with political views, but also a host of related demographic variables, such as where Democrats and Republicans live, as well as some fascinating graphics such as this one purporting to show the growing ideological divide in American politics. Understandably, in covering the release of the Pew Report, many journalists keyed their story to the theme embraced by Pew’s Center President Alan Murray in his (over? )heated summary of the divided state of politics in America. That meant primarily focusing on the data suggesting a deepening partisan public divide in which Republicans and Democrats increasingly don’t like each other. However, it’s not clear that this should be the journalists’ primary takeaway from the Pew Report. In fact, if you dig more deeply into the Report, there is evidence suggesting that the partisan cleavage is not quite a pervasive as the prevailing media coverage suggests. As the Pew authors acknowledge further down in the Report: “These sentiments are not shared by all – or even most – Americans. The majority do not have uniformly conservative or liberal views. Most do not see either party as a threat to the nation. And more believe their representatives in government should meet halfway to resolve contentious disputes rather than hold out for more of what they want.” Readers may wonder why no editorials were written highlighting the fact that, according to the survey results, most Americans do not seem to be pure partisans, and that they believe in compromise as a means for solving political problems! The answer may be that the authors thought the bigger story is changes in levels of partisanship that have come to characterize American politics in recent decades. But even here we need to be careful in assessing the Report’s conclusions. As I’ve discussed in earlier Presidential Power posts, we should not to mistake a process of party sorting as evidence of growing ideological polarization. Consider the Report’s statement that, “Looking at 10 political values questions tracked since 1994, more Democrats now give uniformly liberal responses, and more Republicans give uniformly conservative responses than at any point in the last 20 years.” Contrary to what some might initially conclude, this doesn’t necessarily indicate increasing ideological polarization at the individual level. Instead, as Morris Fiorina has argued, it may instead reflect a process in which more liberals now consider themselves Democrats, and more conservatives self-identify as Republicans, than was case when Pew first conducted this survey two decades ago – even if the number of conservatives and liberals has not changed appreciably in that time. To see what I mean by party sorting, consider two archetypal baby boomer Americans – let’s call them Johnny South, and Billy North. Johnny’s political views owe much to his South Carolina roots where he was born, raised ans still lives. These beliefs include support for a strong military and a muscular foreign policy, a populist streak that supports some types of government spending on infrastructure and commodity subsidies, but a strong aversion to federal intervention into private social mores. Johnny’s counterpart, Billy North, is a life-long New Yorker and, like Johnny, his residence has helped shaped Billy’s political views. Billy is strongly against jingoist military intervention in foreign affairs, is moderate – even progressive – on many social issues, but is also a staunch fiscal conservative. How do these views translate into political behavior? In the 1950’s, 60’s and even into the 70’s, Johnny usually voted Democratic in congressional elections, but he could be persuaded on occasion to vote Republican in presidential elections, as was the case in 1972 when he backed Richard Nixon. Longtime Democrat Fritz Hollings, however, was his political hero. During this same time period Billy typically voted Republican at the Congressional level, but he too would occasionally pull the Democratic lever, as when he backed LBJ in the 1964 presidential election. Billy’s political hero through much of this time is Nelson Rockefeller. The point is that although both Johnny and Billy had coherent and largely stable ideological views, neither self-identified comfortably with one of the two major parties during most of this period; indeed, they occasionally supported the opposing party candidate and on more than one occasion split their vote between the two parties. Now jump ahead forty years. Neither Johnny nor Billy has changed their political views – but their party affiliations and voting habits have undergone a significant transformation across four decades. Today, Johnny consistently votes Republican in national elections – he is a strong supporter of South Carolina Senator Lindsay Graham, and he backed both McCain and Romney in 2008 and ’12, respectively. Billy, on the other hand, cast his last Republican vote for Ronald Reagan in 1984’s presidential election. Since then has uniformly voted the straight Democratic ticket in all national elections. What changed? Not Johnny and Billy’s political beliefs – they did not become more conservative or liberal. Instead, what changed was their understanding of what it meant to be a Republican and a Democrat. That is, they resorted themselves into a particular party – and that is precisely the process, carried out by many people, that the Pew Survey has picked up on and highlighted in their most recent report. Given this process of party sorting, we should not be surprised that increasingly Republicans view Democrats as out of step with the times, and that Democrats similarly have heightened antipathy toward Republicans. The fact is that their view of the opposing party has become less positive as both parties have become more uniformly composed of liberals and conservatives, respectively. To repeat, then, Americans’ views haven’t necessarily become more ideologically extreme – they just fit better under a particular party label. That is why Pew shows a growing consistency between ideology and party affiliation – note that they would find this result even if there’s no real change in ideology at all! To be fair to Pew, there are other findings in their report that are worth discussing, such as the apparent rise in ideological consistency among many Americans, that at first glance seem consistent with the idea that Americans are increasingly polarized in terms of political values. As time permits, I’ll try to unpack some more of their results. But for now beware of sensationalized media reports suggesting that we are becoming an increasingly divided nation. That is the glass-is-half-empty perspective. But the data, along with an understanding of party sorting, indicates that we should probably adopt a glass half-full perspective. Most Americans are not divided into two ideologically hostile camps of unyielding partisans. Instead we have much more in common politically than a superficial read of the Pew findings might suggest. I will develop this point in posts to come. Correction: an earlier version of this post said Pew’s first values survey took place three decades ago – the Pew data I cite here only goes back two decades. Busting Balz: Are Americans More Polarized? There have been any number of instances when a media story tempted me to break my self-imposed hiatus from the Presidential Power blog dating back to my last post in January. Each time, however, I’ve told myself to stay focused on writing the White House staff book. Now, to Balz’ credit, he sometimes seem to believe that this deepening polarization afflicts mainly activists in both parties. Had he stated this more clearly, and stuck to this line of argument, I’d still be writing my book instead of this blog post. Alas, he goes further to suggest most voters are increasingly polarized as well. As evidence, he notes the increased incidence of straight party voting in national elections: “Over the past two decades, the percentage of self-identified Republicans and Democrats who support their party’s presidential nominee has ticked higher and higher. In the past three elections, according to American National Election Studies data … 89 or 90 percent of Republicans and Democrats backed their party’s nominees. Three decades ago, those percentages were considerably lower. The clear implication is that voters are increasingly polarized along party lines.” Balz finds a similar trend in voting in House and Senate elections. In short, the evidence suggests the reason for the increase in party line voting among the rank and file that Balz cites is not that voters are more polarized – it is that their choices are. Longtime readers know I have been pounding this drum for some time, but apparently many journalists refuse to follow the beat. This is perhaps not surprising – journalists thrive on playing up controversy and discord because these topics are inherently more newsworthy. But it is not just journalists – some political scientists agree with the Balz thesis that Americans are increasingly polarized. Accordingly, I want to spend the next few posts discussing the evidence on both sides of the argument. Label this series: Busting Balz.